A garden can be a real deal breaker when it comes to selling real estate and if yours is especially compact, this doesn’t mean you shouldn’t be making an effort. There are loads of great ways to make the most of your open space no matter how small it might be – and here are five of the best. A neglected garden might not seem like the sort of place you want to sit and enjoy your morning coffee or read the newspaper, but creating a comfortable seating area will increase its appeal. Whether you opt for an understated bench or a modern style bistro set, you’ll be surprised just how much more enticing your outdoor space becomes. Once you’ve realised it has a function then you can get to work on making the area that bit more attractive! Hanging baskets have been a mainstay of gardens all over the world for centuries but they’re the perfect choice if space is at a premium. They don’t take up any floor space so you don’t have to worry about losing any of your precious room. Choose different colours depending on the season and your backyard will soon gain a new lease of life. When you want to create the illusion of space inside the home, the chances are you’ll resort to incorporating a mirror or two – so why not use the same strategy in the garden? A few carefully placed mirrors can make all the difference, while adding some intrigue to your open space. Give plenty of consideration as to where you’re putting them to make sure they have the maximum impact. If you’ve always liked the idea of growing your own produce but don’t quite have the required space, then make sure you invest in a herb planter. This can be strategically placed outside your back door so you don’t have to go far to get your parsley, sage, rosemary or whatever else you need. 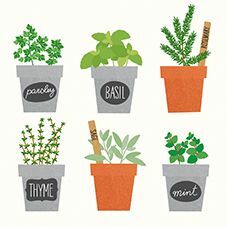 The best part is that you can experiment with different herbs to see which grow in your garden’s conditions. Some smaller gardens even have space for a shed and if yours has a flat roof, you might want to think about making it into a rooftop planting area. Make sure you put all the necessary preparations in place otherwise you could cause damage to the structure, but there are plenty of opportunities for planting in an area you might not have considered.